The "crash" cymbal (onomatopoeia) (or "middle size Turkish cymbal") is a cymbal from medium to large size (13 to 20'' in diameter), usually quite thin. 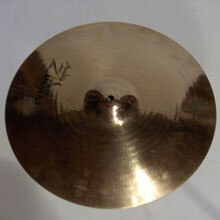 Zildjian A custom Projection crash (thicker) 17": "ping"
It has the same manufacturing methods than ride. It is mainly its thinness which gives its easy saturation qualities ("crash" of cymbal). Nevertheless, it is still recommended to strike with the shaft (on the flat and not the edge, which would damage it (see "cymbal strokes")) rather than the tip, to provide its saturation. For obvious reasons of conservation, it is strongly advised not to clamp fully a crash and leave it well "loose" on its stand (some recent stands of some brands are equipped with "stops" for this purpose on the nut, to prevent to tighten the wingnut completely). The crash is the essential complement of the ride and the hi-hat. Any drummer has at least one, from the origins (Warren "Baby" Dodds ). 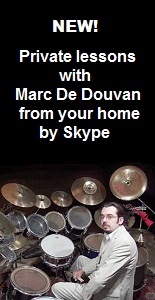 Some play on a variety of crashes as Vinnie Colaiuta (3 crashes), Terry Bozzio (6), Mike Terrana (4), Mike Portnoy (7), Nicko Mac Brain (6), Aquiles Priester (5) or Lars Ulrich (5). But in rental rehearsal studios, we find unfortunately often only one (hence the interest to bring your own set of cymbals with you). The crash is the highest punctuation used in modern drumset in the so-called "hits" or "peaches" (literally translated from French "pêches", meaning also "punch" in slang) which is to hit it in unison with the bass drum (you can also use a tom or even the snare drum to dry the sound). This sound is reminiscent of the thunder and was executed in the same way from the beginning of Turkish cymbals and symphonic music, much later (but with at least two musicians: one bass drum player and one cymbal player). Some drummers play crashes with single stroke roll (passing from a crash to another) in unison with single stroke roll on bass drum (with double bass drum or bass drum double pedal). Mike Terrana , Marco Minnemann and surprisingly Horacio Hernandez (latin jazz drummer), are masters of this technique, alternating single stroke roll peaches and snare in colossal speeds. The "crash-ride" is a compromise between ride and crash, which saturates less easily than normal crash, but in principle, any crash cymbal played softly with the stick tip can avoid saturation and give a "ping" (but quite vague and with quite dull attack because its fundamental tone is too high, anyway). That said, in "hard rock" style a crash is often used as a ride, with eighth note beats in independence (with the tip, but without restraint, intermediary sound between "crash" and "ping" or downright with shaft stick against the edge), which then gives a fuzzy sound like the distorted electric guitars a bit like the open hi-hat beaten with stick. The "crash" is the stick hit which looks the most like the traditional sound of cymbal strikes one against another, with both hands. With mallets, you can put the crash cymbal in progressive saturation (crescendo), without hearing impact (a bit like if it was a crashing sound in reverse), which is highly suggestive to create effects mimicking the waves or the wind (Jack de Johnette and Max Roach , often use this technique, which is often used in the introduction or conclusion of a piece, because out of tempo). The more the crash cymbal will be "dark" (with low harmonics and complex timbre) the more it will have inertia to go to saturation. In other words, even if it does, it does with a "mellow" attack and as it was delayed (with crescendo and decrescendo). This type of "soft" crash is appreciated by a lot of jazz drummers because it stays unobtrusive and not brutal. Finally, you can amuse yourself to mute the crash with the fingers of your free hand just after hitting (older technic, already used in "New Orleans" style before the invention of the hi-hat pedal, which muffle the cymbals by foot pressure) to create an unexpected and "super dry" effect.